Standing up to play Dance Dance Revolution type games is sooooo much work. Thankfully, [Jebadiah0001] is taking the strenuous exercise component out of the game by altering a guitar controller to play dancing games. 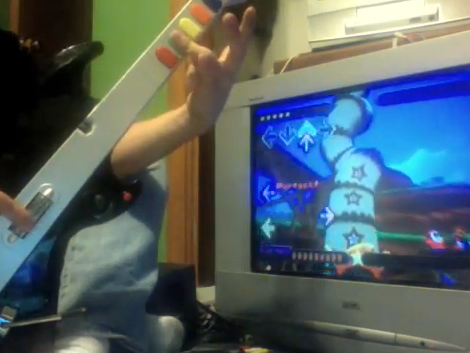 He’s calling it Bass Hero because the DDR games only use four inputs, reducing the guitar controller to four string buttons like an electric bass would have. His implementation uses a GameCube controller to connect to the console. He took it apart to get at the button connections. Each string button on the guitar is connected on one side to a button on the GC controller, the other side is a common connection. But instead of pulling those straight to ground, he routes that signal through the strumming actuator. This way the player can get the correct buttons ready, then strum at just the right time to complete the circuit. It certainly makes the harder levels of DDR quite a bit easier. See for yourself in the video after the break. That title’s a mouthful but you’re already familiar with the technology and application of foot pads as sensors in games like Dance Dance Revolution. The usbddr project sought to make a USB connected DDR controller from scratch. The microcontroller used is an Atmel ATmega8 running the V-USB firmware for connectivity and uses the analog to digital converts to read in data from the capacitive sensors. The physical implementation is cleaver. The base plate has a capacitor plate attached to the top of it and the tile has the other capacitor plate attached to the bottom of it. The two are separated by some weather-stripping which is spongy enough to allow compression, bringing the two capacitor plates together. We’re not convinced of the long-term durability of the system. We certainly don’t think it will hold up to very much hard-core DDR playing. But we would love to see a Super Mario RPG style puzzle to unlock the door to the ‘castle’ at a child’s birthday party. One of the ideas that’s been floating around my How-To bin for a couple of years is an under carpet zone switch dance pad. [sprite_tm] beat me to it in late 2006, and did it even better. He was using a QT160 chip – a nifty six channel capacitive touch sensor to make touch switches. Instead, he used an Atmel to duplicate the technology. 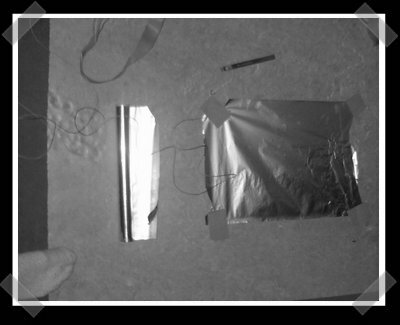 He was able to place foil panels below his carpet. Step on one and it acts like you just closed a switch. The QT160 is now available, but the atmel he used is actually cheaper.